Earlier, as every year Public Service Commission/Lok Sewa Aayog had published vacancy for the post of Nayab Subba in public service. Lok Sewa Aayog normally conducts examinations in two phases for the vacant posts of Nayab Subba (First Class Officer) each year all over Nepal. In the Nayab Subba Na Su First Phase/Paper Exam 2075/2019, thousands of candidates had participated from different regions of Nepal. Among thousands, some of them have selected for the Second Phase (2nd Paper and 3rd Paper) examination of Nayab Subba Na Su. This result update is for the Nayab Subba Result for first phase examination conducted by Lok Sewa Aayog on 25 Fagun, 2075. Similarly, this Na Su result update is for the vacancy of Nayab Subba published on 25 Poush, 2075. Public Service Commission (PSC)/Lok Sewa Aayog has started to publish the results of NAYAB SUBBA (First Class Officer) First Phase/First Paper written exam 2075/2019 frequently. We will update the results once Lok Sewa Aayog updated their page. Please visit our page regularly. See the snapshot of the result published by Lok Sewa Aayog. 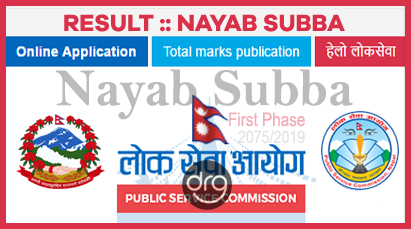 All the information for the Nayab Subba result update has collected from the official website of Public Service Commission/Lok Sewa Aayog.The detail of Nayab Subba NaSu results as well as the date and time for next exam has given below. Also, we have provided the First Phase 2075/2019 Nayab Subba Results direct links to Lok Sewa Aayog official files. You can see the Nayab Subba result 2075/2019 of related place by clicking on it's name. Check and view the Nayab Subba (First Class Officer) Result 2075 by clicking your desired links. The exam date for the second phase exam of Nayab Subba NaSu is 7 Baishakh of 2076. Similarly, the exam time for the Second Paper (Social and Economic Status) is 11:00 am and the exam time for Third Paper (Optional Subjects) is 2:00 pm. Also, the date and time for Nayab Subba Na Su Third Paper (English and Diplomatic Subject) are 8 Baishak, 2076 at 2:00 pm. #What to do if I lost the Entrance Card for Nayab Subba NaSu Exam 2075-2076/2019? You can use the same Entrance Card which you have used in the First Phase/First Paper examination 2075. However, if you have lost your Entrance Card, you can obtain it again from the official website of Public Service Commission Lok Sewa Aayog. To get Nayab Subba entrance card again, you will have to log in to your account from Online Application section of Lok Sewa Aayog’s website. After that, you will have to find out “eCard” there and select the proper one. Then, you can print your Nayab Subba NaSu Entrance Card or you can Download it as PDF to print later. Candidates are advised to reach the Nayab Subba NaSu Exam Centers at least an hour before the time. 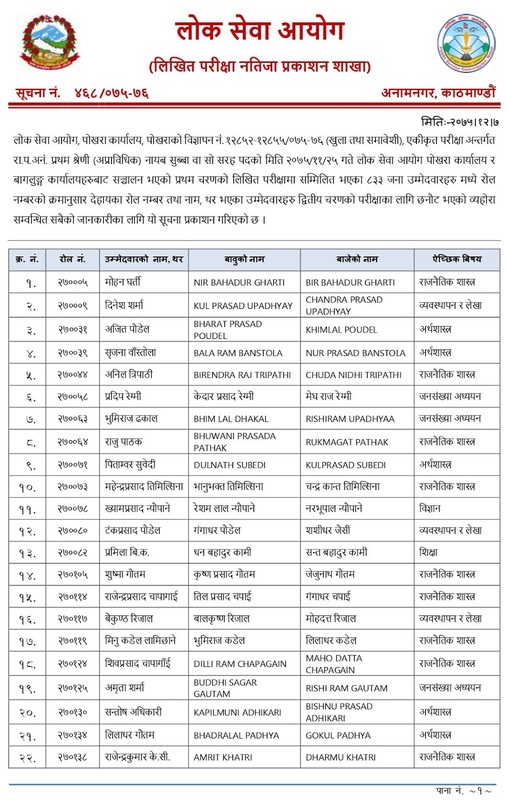 Also, we wish best of luck to all the candidates of Nayab Subba NaSu Second Phase (2nd Paper & 3rd Paper) examination 2076/2019. 0 Response to "Result Of NAYAB SUBBA (Na Su) | First Phase/Paper | Written Exam 2075/2019 | Lok Sewa Aayog [PSC]"